As Russian-born pianist Katya Apekisheva ramped up the rolling chords of Rachmaninov’s G minor Sonata, Opus 19, one of two long drapes framing the Perth Concert Hall stage seemed to twitch. A ghost, perhaps, summoned by close channelling of the lateromantic master’s art? British cellist Natalie Clein described the piece as “a piano sonata with a bit of cello”, launching with a mellow lament over jazz-like chords before morphing to the lush Rachmaninov palette. The second movement, allegro scherzando, told a sardonic, Slavonic joke; query and punchline in the piano with cello the appreciative audience. It was a microcosm of the evening; two soloists in collaboration, supporting, never overpowering the other. In the andante, piano spoke of passion and sunlight while cello waxed and waned like the moon. The finale, allegro mosso, was fast and furious, building to a warm down in darkly delicious chords before a firecracker coda. It was a climax written by an unparalleled pianist; bookended at the start of the night by Kodaly’s Sonatina, written by a cellist who, guest speaker Alan Lourens suggested, couldn’t have done it justice. It was, nonetheless, a fine amuse-bouche; fluid piano limpid as a mountain stream with reflective cello overlaid, and an elegiac ending perfectly judged. Australian Natalie Williams’ The Dreaming Land, a sonata commissioned for Musica Viva, made the most of the artists’ interplay. Voices of the Ancients offered piano rivulets under sparse and delicate cello, like a gentle breeze through nature or the echo of a songline. The Chanting Walker suggested the darker side of the bush, melancholy cello over sinister piano a bittersweet summons to displaced souls. The Ethereal Furies unleashed pulsating piano and almost neurotic cello, deep yet dance-like in its energy, rising to a rousing finale. Williams’ work seemed to hint at Tom Keneally’s take on the “spacious” Australian soul, and will doubtless grow with reinterpretation. I fell in love with Natalie Clein. Warm, unegotistical yet engaging, she spoke to the audience in the same vein as a simple remark attributed to her in the program, “The music is more important than me.” And her playing is just the same, unegotistical but always engaging. She opened the program with Vaughan Williams’ Six studies in English Folksong, where she identified with the relaxed yet loving approach to England these pieces display. Lyrical without sentimentality, they allowed space for the relaxed side of her very special tone, which has so much “colour”, that is to say, strong harmonics, in its sound. Then she played Bloch’s three pieces, From Jewish Life, where the plangent possibilities in this tone emerged, like a flower opening, and she sounded at times like Rostropovich. These pieces can sound emotionally self-indulgent, but Clein’s rendering, though lacking nothing in emotional appeal, engaged the audience’s hearts without drowning them in tears. She got the jokes which go cheek by jowl with sorrow in these pieces, and this occasional playfulness rescued the music from anything maudlin. Up until now Katya Apekisheva’s contribution had been very much an accompaniment; beautiful, tactful, supportive, but definitely secondary. That changed completely with the next piece, which was the big eye-opener for me in the program. Rebecca Clarke’s viola sonata is a masterpiece. Written in 1919, when she was 23, and anonymously submitted to a competition whose judges refused to believe that it was written by a woman (don’t get me started; we still refuse to believe, for example, that Anna Magdalena Bach wrote the cello suites attributed to her husband) this work is apparently well known only to viola players. Clarke suggested that it could be played on the cello, and hearing Apekisheva and Clein paint the sonorous landscape of this vast canvas it was hard for me to imagine that a viola could have done it justice. (But of course that is only because I haven’t heard it on viola.) Virtuosic for both players, in a musical language thoroughly of its time, based on that of Bloch but with splashes of Ravel and Debussy, its cascades of chromatic scales over dominant ninth chords raced by in great waterfalls of sound, only to subside into moments of great tenderness. The program contained the premiere performance of Natalie William’s The Dreaming Land. Williams, a well-established Australian composer, was commissioned to write this piece by Musica Viva, who put together the tour by Clein and Apekisheva of which this concert was part. Described by the composer as a musical journey over the landscape of Australia, it was only in the rhythmic finale that I had any sense of travelling – the first two movements seemed transfixed in awed reverie at the imponderable vastness of this country. They reflected more the title of the work than any sense of travelling. The piece is charming, unchallenging, and played with great commitment by the performers. It is remarkable, however, that Australian composers still feel the necessity to describe this country, as though it is still, really, a foreign place to the foreign settlers, the group to which most of our composers belong. Oh, what fun Clein had with the Beethoven sonata! The last work on the program was the C major sonata, op 102 no.1. This piece, the polar opposite of its opposite number, the D major op. 102 no.2 but having a great deal in common with the A major piano sonata, op 101 in style and form, is a little jewel among the five Beethoven cello sonatas. More like a conversation between the two instruments than any of the preceding pieces in the program, it moves mercurially between reflection, humour, and anger, no sooner establishing one mood than breaking into its opposite. The interplay between Clein and Apekisheva, who must have a wicked sense of humour, was a delight from start to finish. I would walk miles with peas in boots to hear Natalie Clein again. For all the complexity of this twenty-one movement, six-work program, cello virtuoso Natalie Clein’s sole concert during the Festival proved a very simple affair. A plethora of darkly romantic pieces before interval was contrasted with a second half full of vivid, airy objectivity and this was all held together through Clein’s uncanny ability to mould her playing to both light and shade so persuasively. For example, the concert’s final work, Beethoven’s C major Sonata Op 102 No 1, found her pulling back to merge as a true duo partner in the most classical sense with pianist Katya Apekisheva, both violin and piano sounding as one in the intricacies of Beethoven’s mature style. Earlier though, in the plangent colours and tonalities of Rebecca Clarke’s mighty Sonata for Viola (or cello) and Piano she was forthright, even dogmatic in its declamatory romantic utterances leading the heavily written piano sonorities at every turn. Clein is above all an intelligent player who senses the delicate nuance here, the stylistic trait there, encasing them in finely wrought interpretations that always make sense. Her golden tone effortlessly filled the Town Hall whether in quiet contemplation, such as Bloch’s From Jewish Life or in the effervescence and song of South Australia’s own Natalie Williams ’The Dreaming Land’ in its world premiere tour, a beguiling, hugely attractive work. With Apekisheva in top form responding to her every musical whim, Clein could allow her brilliant musicianship full rein in this riveting, high octane recital. "Hands up: I hadn’t realised that Rebecca Clarke had authorised a cello version of her much-recorded Viola Sonata, although it has in fact been recorded by at least two cellists. But still, I suspect that this beautifully produced recital from Natalie Clein and Christian Ihle Hadland will be many listeners’ first encounter with the cello version of this superb work, and I strongly suspect that they’ll be as impressed by it as I was. The sonata reveals several new facets when played on the cello, the principal one being the new depth and physicality of the sound world. Clein makes the most of that, with a tonal palette that ranges from thick charcoal-black to muted pastels, beautifully controlled and shaped in the service of Clarke’s ardent musical narrative. The first movement is headed Impetuoso and throughout this disc Clein and Hadland never stint on commitment. In the second movement of Bridge’s wartime Cello Sonata, for example, the transition from uneasy calm to jagged, angst-ridden turmoil and on to soaring, impassioned lyricism is handled with poetry and passion. Clein is never afraid to let you hear the rasp of bow on string, and Hadland, too, knows how to make a climax thrillingly sonorous without overwhelming his partner. Around these two imposing central performances, the pair unerringly find the right atmosphere for each of the various miniatures by Vaughan Williams and Bridge; catching the wit of Bridge’s Scherzo and the lilt of his Serenade as well as the sense of lengthening shadows that lies behind all that melodic charm. The acoustic is lucid, natural and intimate: excellent booklet notes by Paul Hindmarsh and cover art by Eric Ravilious are simply the icing on the cake." "Natalie Clein proves a dramatic, wholehearted interpreter of the cello version of Rebecca Clarke’s Viola Sonata. Recently Raphael Wallfisch and John York recorded it for Lyrita and not only do Clein and Christian Ihle Hadland drive through it two and a half minutes faster, they have been recorded in a much more immediate, forward acoustic, which only intensifies the vibrancy and intensity of their reading. These are two very different ways of approaching a work that in recent years has become something of a viola repertory piece; the soft-grained but subtly distanced Wallfish-York, or the almost overwrought Clein-Hadland. Yet if the younger pair maintained that dangerously exciting adrenalin their performance would buckle; they don’t. Their reflective, inwardly musing passages are just as powerfully phrased and just as compelling. Legato is ardently explored, the folkloric pizzicati in the central fast movement ricocheting with great youthful panache, and in the bipartite finale – Adagio then Allegro – she vests that opening section with a lovely range of colours before unleashing renewed passion. There’s real kinship at work here, performers and work at one; the sonata positively sizzles in this performance. Note too that Clein and William Foster prepared the cello part. The companion sonata is Frank Bridge’s, composed between 1913 and 1917. Here the Clein-Hadland outrun by precisely the same amount – two and a half minutes - another older Hyperion pairing, the Nash Ensemble’s Paul Watkins and Ian Brown. Watkins, himself no slouch in the declamation stakes, with a raft of splendid Chandos British cello sonatas to his name, sounds positively becalmed next to the molten Clein. Some may not always find her intensely vibrated playing, here and also, perhaps, in the Clarke to their liking. It has to be admitted that sometimes it sounds too booming and intense. And, a stern critic might note that Watkins is more persuasive in the music’s nostalgia. Yet, for all that, Clein runs the gamut of emotions and there is a real personality at work. This applies to what some might consider Bridge’s morceaux but Clein’s not having it at all. The Serenade – you can here, and elsewhere, hear her anticipatory sniffs – is played with more ardour than is usually encountered in this early work. And she can hardly be accused of underplaying the Scherzo of c.1902 which is dispatched with a will o’ the wisp virtuosity that sizzles with flair and then has the wit to treat the B section with the coyly salon charm it requires. 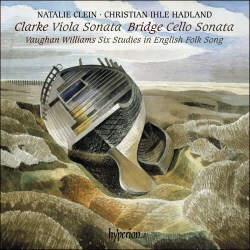 Vaughan William’s Six Studies in English Folk Song close the disc, their compact charms conveyed with apposite refinement. I’d single out her phrasing in Spurn Point – absolutely lovely – and the piece that seems to convey something of Clein’s own sense of fearless commitment, As I walked over London Bridge. The earlier Bridge Hyperion disc sported Eric Ravilious cover art. The label’s design team clearly has its own sense of wit as they’ve used another Ravilious for this one. The documentation is well up to Hyperion’s high standards and I can say without any hesitation that if you’re looking for high-octane performances of this repertoire, then make the Clein-Hadland duo your first port of call."